After a long, grueling summer featuring dozens of exciting events and millions of dollars in prize money awarded, the 2017 World Series of Poker Main Event is under way at long last. Day 1a began Saturday at 11 a.m. with players dispersed throughout the Amazon Room and Brasilia Room in the Rio All-Suite Hotel & Casino. By the time registration closed at the end of the dinner break, 795 players had entered the field. That made it the biggest Day 1a since 2013, when 943 entered the first starting flight. A trio of former Main Event Champions had divergent paths throughout the day, with two of them surviving. Defending champ Qui Nguyen sauntered in early in the day, clad in his trusty raccoon hat and sporting a wide smile. He said it was a totally different feel than 2016. "It was very much different," he said. "Last year, I came here like just a guy. Not like nervous, but not comfortable, you know? This year, I come back and feel very comfortable." 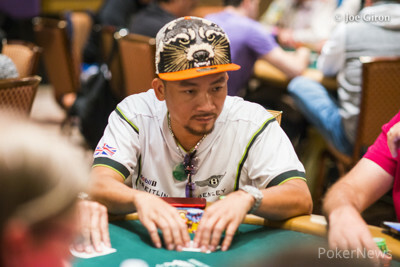 Nguyen spent a good chunk of the early portion of the day on one of the featured tables, where he made some moves that were reminiscent of his fearless play at the WSOP final table last year. Not all of them worked, such as when he tried a bet/three-bet line with six-five of diamonds against a player who flopped Broadway. He also got himself in a four-bet pot against the aces of Harald Sammer and had to fold post-flop. Ultimately, though, enough of them worked out to get him through to Day 2 with 96,700 chips. "Actually, like, I have to slow down a bit because the players — they know how I play," he said of his strategy. "So, they try to call me with anything, you know? So, I had to slow down." Martin Jacobson wowed poker fans everywhere in 2014 with his flawless demonstration of short-stack poker at the Main Event final table. However, Jacobson had a rough go of it on Day 1, finding himself short on chips early, even snapping a photo of his stack when it was barely over 2,000 to post to Twitter. Grinding one of the shortest stacks in the Amazon Room for hours, he found himself all in and at risk for 7,050 during Level 5 (250/500/75), the last of the night. Jacobson had two outs with pocket nines against an opponent's aces, but it was a short sweat as he flopped quads to double up. The Swede finished the day with 36,800. The 2007 Main Event Champ, Jerry Yang, was not so fortunate. Yang got in a three-way all-in just a bit before play ended holding ace-queen against two players with pocket pairs, jacks and nines. Steven Warburton's jacks held up for a triple, and Yang got no help against the nines for the side pot. Others joining Yang in having the most disappointing day of the year for tournament players included King's Casino owner Leon Tsoukernik, Matt Savage, Blake Bohn, Anthony Spinella, Sorel Mizzi, and Dan Shak. On the other side of the spectrum, British player Sam Grafton finished among the leaders after a great start to the day that saw him win a huge pot early with a flush on the river against a set. Grafton parlayed that into plenty more pots, amassing 600 big blinds and nearly four starting stacks by dinner time. "It's been a dream day," Grafton said after bagging. "Everything I tried has gone well for me. When I was bluffing with some outs, I made them on the river. Can't complain; I'm really happy with my stack." 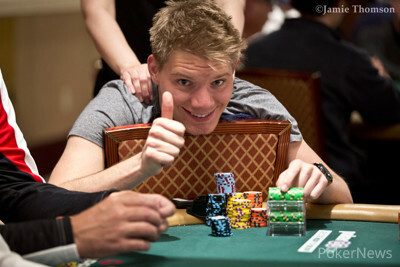 However, even Grafton's 231,600 chips can't compare to the 276,000 that Morten Mortensen put in the bag. The Danish player with nearly $1.1 million in live cashes had a big stack for at least the last three levels, and he finished as strong as possible by busting another player to end the night and rocket into the top spot. Mortensen flopped a combo draw with eight-nine of hearts and turned a gutshot straight against a player holding kings. Mortensen's opponent shoved over his turn bet drawing dead, and the Dane snap-called the jam and dragged a pot worth over 100,000. "I was fortunate enough to be dealt a lot of playable hands and I was able to win most of them," Mortensen said after play concluded. "Other than the last hand of the night, most of the pots I played weren't very big. "I have two days off, so I will be going to party tomorrow night, and then I can chill until Day 2. I only have five times the starting stack, and there should be around 7,000 runners, so there is still a long way to go." The 576 players who made it through the day will convene for Day 2a on Tuesday at 11 a.m.
Grafton said he's really looking forward to a relaxing few days with the peace of mind of having piles in the bag while others fight to get to where he's sitting. "It's going to be a really nice three days for me now by the pool, knowing this stack is in the bag," he said. "I can watch my friends try and fail, knowing that the equity of my stack is just rising as they tumble out of the tournament. So that's going to be a very nice feeling." The next step for the WSOP Main Event is Day 1b, which begins Sunday at 11 a.m. Streaming coverage will be available on ESPN2 from 11 a.m. to 3 p.m., and live coverage will be here on PokerNews throughout the duration of the day. In the final hand of the day, Morten Mortensen dragged a monster pot which gave him the end-of-day chip lead. The pot was already up over 35,000 as the board showed . Mortensen bet 20,000, and his opponent went in the tank. Eventually, he moved all in for 52,000, and Mortensen called with lightning speed. Mortensen had his opponent drawing dead with the nut straight, making the river meaningless. 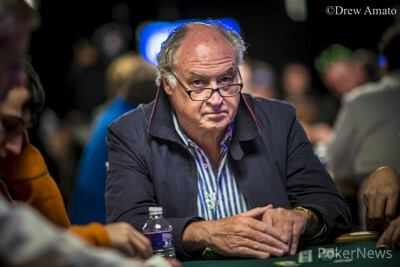 With the pot of more than 100,000 chips, Mortensen ended the day as the chip leader with 276,000. In one of the last hands of the night, three players limped and Oleksii Khoroshenin raised to 3,000 on the button. Ronnie Brown called and Zorlu Er then shoved for his last 20,200 from the hijack. Khoroshenin called and Brown folded to set up the following showdown. The board came and Er failed to get there, falling short of making Day 2. With about 16,000 already in the middle and the board reading , Donnacha O'Dea bet 6,500 from the cutoff into his lone opponent on the button. After a few moments of thought, the button folded, and O'Dea took the pot to bolster his stack at the very end of play on Day 1a. Doug Polk, in the cutoff, opened to 1,200. Mike Matusow three-bet to 2,600 on the button. Polk called. The flop came and was checked through to the turn and river. Polk checked. ''I have to look to see if I can bet,'' commented Matusow. Matusow peeked at his cards and threw in a bet of 1,600. After a few seconds of reflection and of talking to Matusow without getting an answer, Polk continued, ''I'm such a nice guy, I am gonna pay you off''. He proceeded to call. ''I have ace-high'' said Matusow, tabling . Polk showed , laughed, and commented, ''This was a beautiful bet!'' raking in the pot. After previously escaping from elimination, Jerry Yang failed to hold up in his next all-in showdown. The camera crews were just finished filming, and the board was already rushed away with Steven Warburton stacking chips in the nine seat. Apparently, it was a three-way all in with Warburton as shortest stack and pocket jacks. Yang had the second-biggest stack and , while a third player in the hand had pocket nines. Warburton scored a triple-up, while Yang found no help for the smaller side pot to join the rail in the last level of the night. With about 7,500 in the pot, the flop was . There were three players in the hand, and the first player to act led out for 3,100. Anatoly Filatov was to his left and raised to 8,000. The third player in the pot folded, and the initial bettor made the call. The turn brought the , and the action was checked to Filatov. He bet 12,000, and that was enough to get his opponent to lay his hand down. At the tail end of a big hand with Jon Turner, Jerry Yang bet 11,000 on the river of a board, and Jon Turner called. Yang was caught bluffing with , and Turner had that beat with for two pair. The flop gave Yang the lead, and he stayed in thanks to the turn and river. With around 6,000 in the pot, the flop came . Patrick Korsar was on the button and was heads-up with the player in the cutoff. The action was checked to Korsar, who bet 2,500, and his opponent called. The turn was the , and the cutoff checked again. 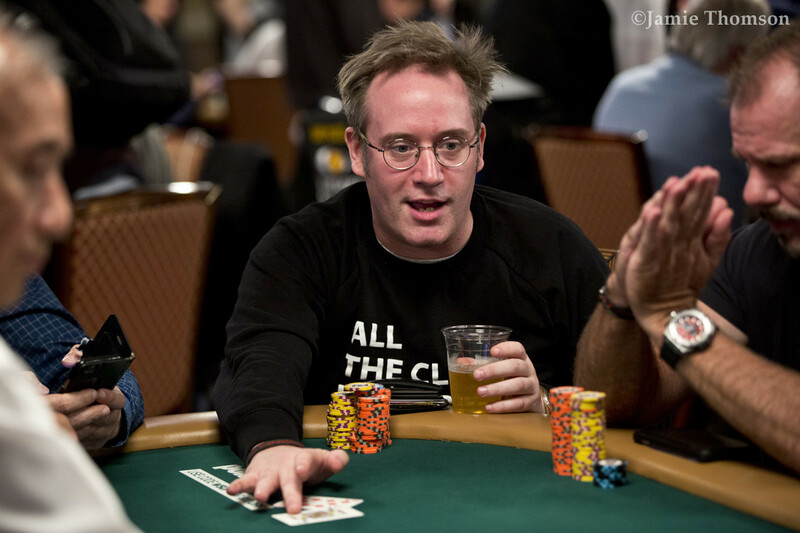 Korsar made a large bet of 16,800, and his opponent didn't waste much time making the call. The river landed the , and both players checked. The cutoff tabled for a full house on the flop, and Korsar chuckled a bit as he tossed his cards into the muck. Andy Bloch bet an unknown amount with a T5,000 chip into a pot of about 10,000 after one check on a flop. The player on the button made it 12,000, and Bloch called after the third player folded. Both remaining players checked the turn, with Bloch's opponent asking to see his stack. Two more checks followed on the river. Bloch turned over the . When his opponent didn't move, Bloch showed the behind it and took the pot. Mike Ross, who finished as the runner-up in Event #21: $1,500 8-Game Mix 6-Handed, sat down in Level 4 and has since steadily increased the stack. With already more than two times the starting stack, Ross just tangled with a short stack, and the latter was all in with after a flop of . Ross looked him up with , and the turn and river gave him the better hand, as the two pair of his opponent were counterfeited. "Did you actually lose a hand all day?" someone at the table asked, and Ross just grinned. Sam Grafton appears to be the current chip leader on Day 1a with less than one hour remaining on the clock, however, several players in the Brasilia Room may become contenders for the top spot tonight. Furthermore, nine tables remain in the Amazon Room, including big stacks Rifat Palevic and Morten Mortensen. After an open from the hijack to 1,200, Andy Bloch made it 3,350 to go in the small blind. The hijack shoved all in for 11,800, and Bloch called in short order. Bloch flopped an , but it was accompanied by the and the . The turn and river did nothing to help him further. With about 5,000 chips already in the pot on a flop, action checked to Chris Hunichen in the hijack, and he bet 2,200. Alan Smurfit raised to 7,000 from the cutoff, a player in middle position folded, and Hunichen called after a few moments of contemplation. The fell on the river, and Hunichen bet 8,000. Smurfit raised to 25,000, and after sighing and re-checking his hole cards, Hunichen folded. Smurfit took the pot to put his stack over the 100,000-chip mark. David Eldridge bet 1,500 from an early position with the board reading . An opponent who checked in the big blind raised to 4,000, and Eldridge called. Both players checked the river, and Eldridge's bested his opponent's . Dylan Honeyman started well into Day 1a and quickly almost doubled his stack, but the seat that formerly belonged to the Australian is now empty while Ryan Hall dominates the action with a massive tower of chips. One table over, a limped pot ended up with Matthew Kelly running out of chips. On a flop, Kelly shoved his last 9,000 with , and Vincent Liu called in the big blind with the dominating . Kelly picked up more outs on the turn with a gutshot straight draw, but the river was a blank to eliminate Kelly.